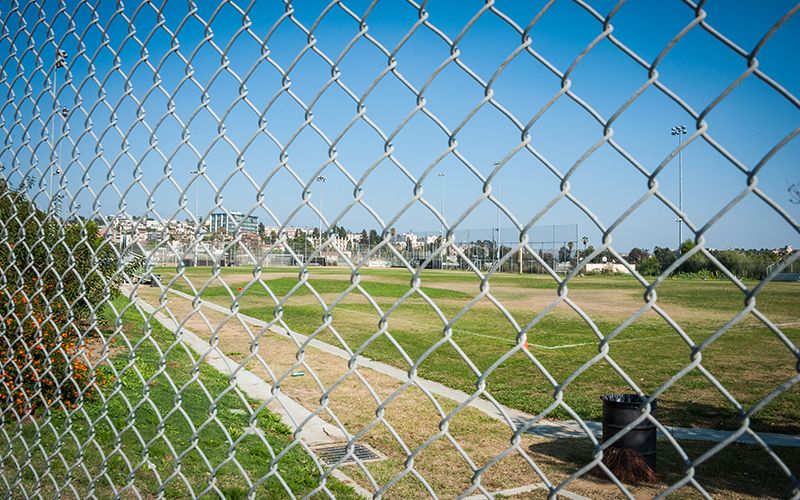 A LAPD helicopter buzzes over the soccer field of Edward R. Roybal Learning Center on the outskirts of downtown L.A. and circles back toward the city’s ever-rising skyline. 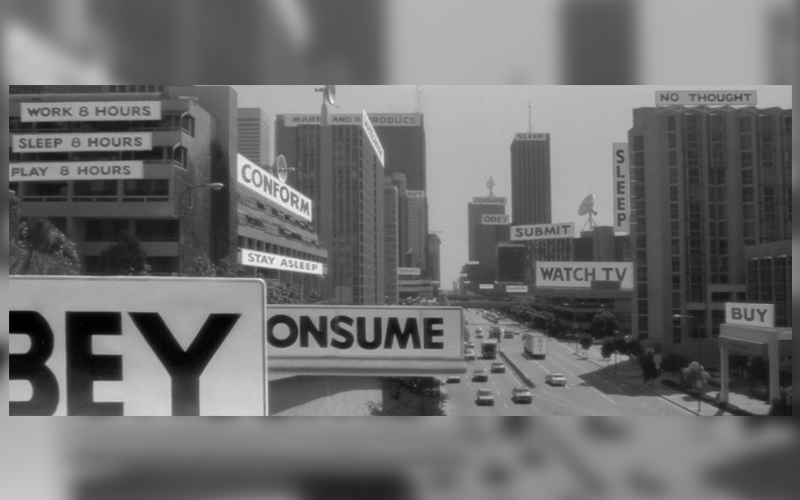 On this particular afternoon, one day after the crucial midterm general election and having recently rewatched John Carpenter’s They Live, I wonder to myself if multidimensional aliens are watching from the sky. In November of 1988, four days before George H.W. 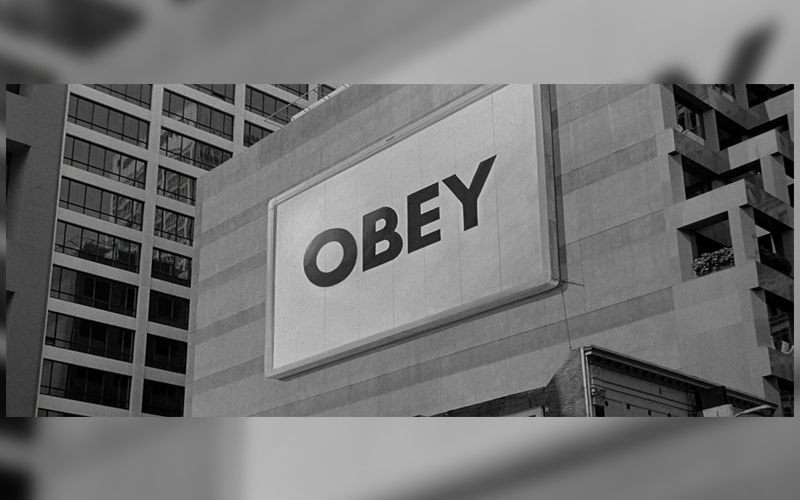 Bush was elected president of the United States, Universal Pictures released They Live, the story of covert alien suppression over the masses. 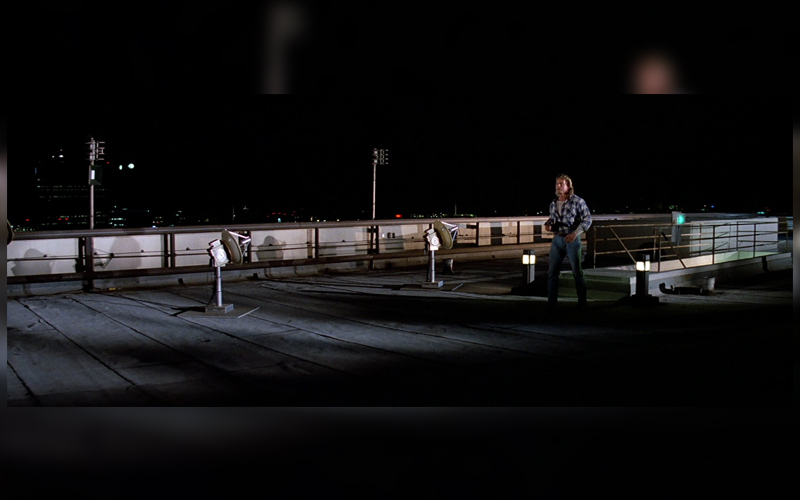 The movie is, arguably, the most topical film of Carpenter’s four-decade career, which includes box-office hits and cult classics like Halloween (1978), Escape from New York (1981), The Thing (1982), and Big Trouble in Little China (1986). 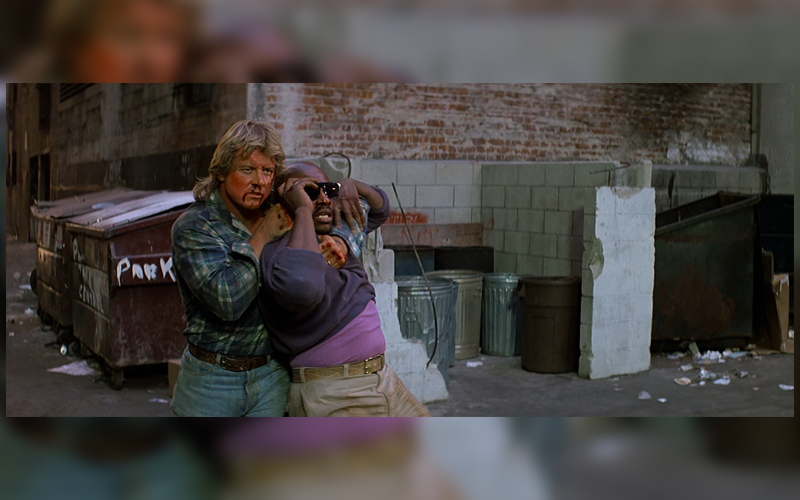 Thirty years later, They Live is particularly significant in America’s current social and political climates. The sci-fi action film is based on Ray Nelson’s short story, “Eight O’Clock in the Morning” (1963), and Bill Wray’s subsequent comic adaption, “Nada” (1986). In Nelson’s story, George Nada awakes from being hypnotized and can suddenly see people transform into alien beings that are unsuspectingly controlling the human race. Writing under the pseudonym Frank Armitage, Carpenter took the story and turned it into a contemporary allegory of authority, government corruption, consumerism, and, most specifically, Reaganomics. 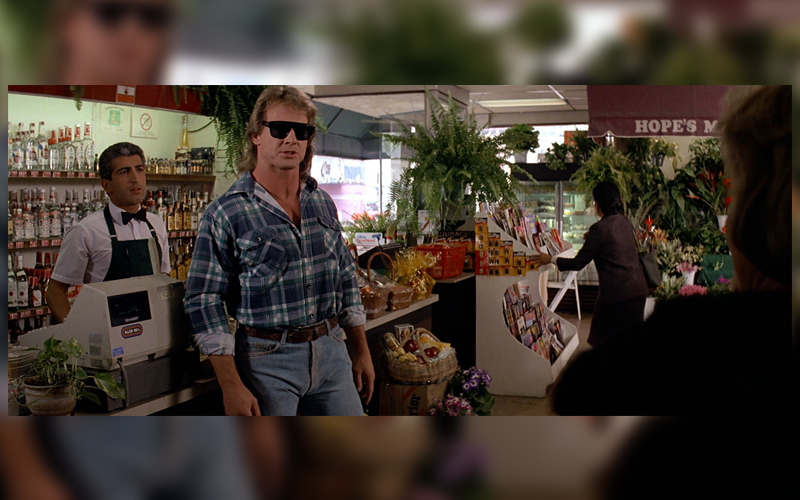 George Nada was changed to John Nada, an out-of-work drifter played by inimitable wrestling superstar Roddy Piper, who passed away in 2015. Instead of waking up from a hypnotist’s spell, in the film Nada can see the aliens—who are credited as “ghouls” on IMDb—with specially engineered pairs of sunglasses and contact lenses. The reptilian and multi-ocular, blob-like aliens from the original story and comic, respectively, gave way to humanoids with silver eyes and skulls partially exposed through blue flesh and underlying layers of maroon muscle. Nada also wouldn’t have to fight the good fight alone: after one of the film’s most famous and insane scenes, Nada convinces Frank (Keith David) about the dismal state of affairs and from then on has a partner in taking out the ghouls. 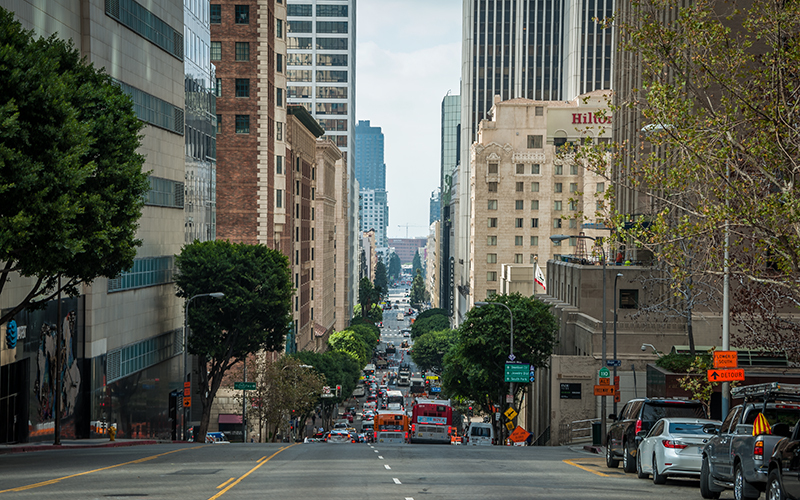 Figueroa St. from 1st St.
With an estimated budget of $4 million—less than the budgets of six of Carpenter’s seven previous films—it was certainly cost effective to stay close to Hollywood and minimize the number of locations. 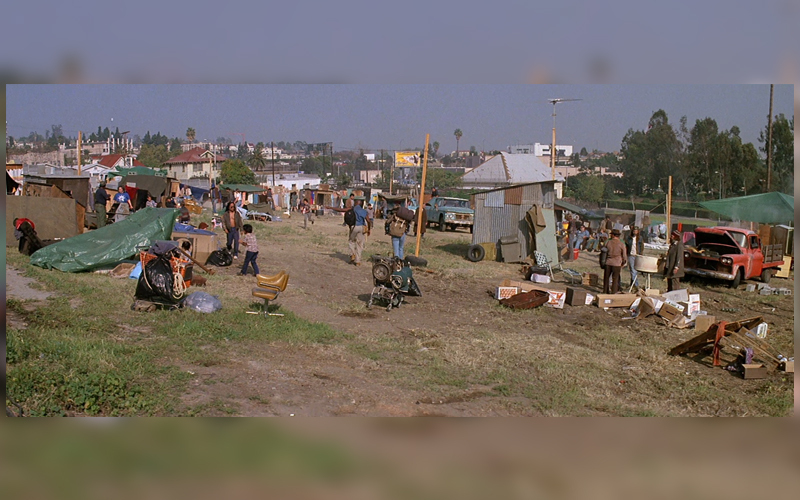 But more important, using L.A. as a backdrop for a story about the working poor fighting the powerful elite class was a vivid representation of a city in which 75,000 manufacturing jobs were lost between 1978 and 1982. The opulence and excess of 1980s “Hollywood” stood in stark opposition to the issues of the decade, such as national welfare reductions, wage gaps, and weakening unions. 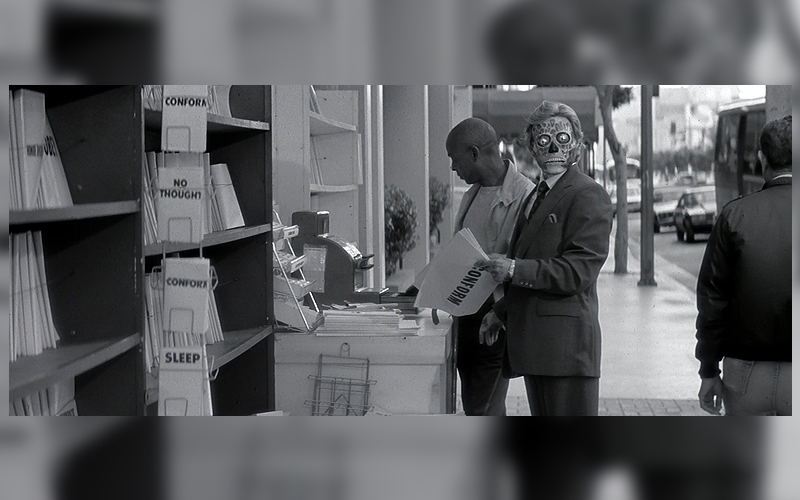 They Live was at right at home in Los Angeles. 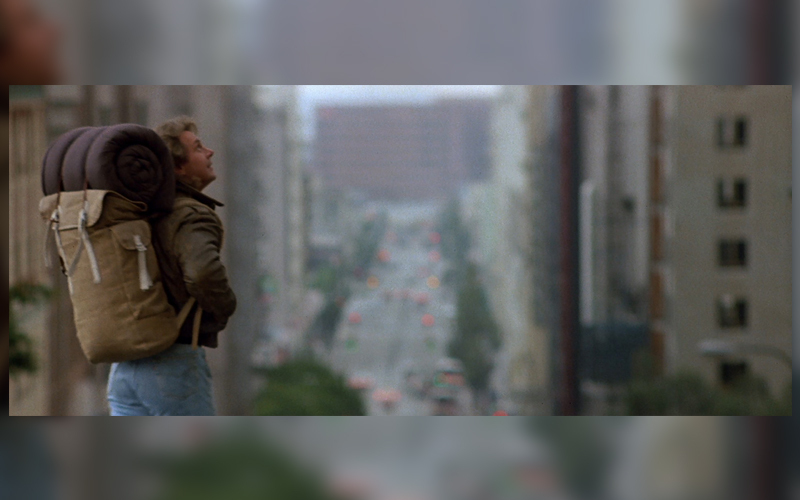 Aside from a handful of constructed sets and a cliff-side house in the Hollywood Hills, They Live was shot primarily in and around downtown L.A. Anamorphic widescreen shots of glistening new skyscrapers are juxtaposed with garbage-strewn streets of Skid Row. 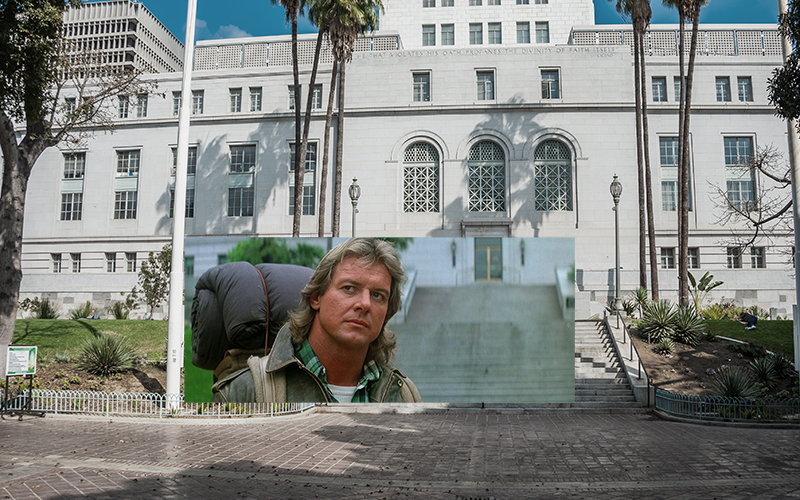 For the 30th anniversary of Carpenter’s sci-fi parable, we revisited many of the film’s downtown locations, which you’ll never see the same way once you’ve watched They Live. Spoilers ahead. 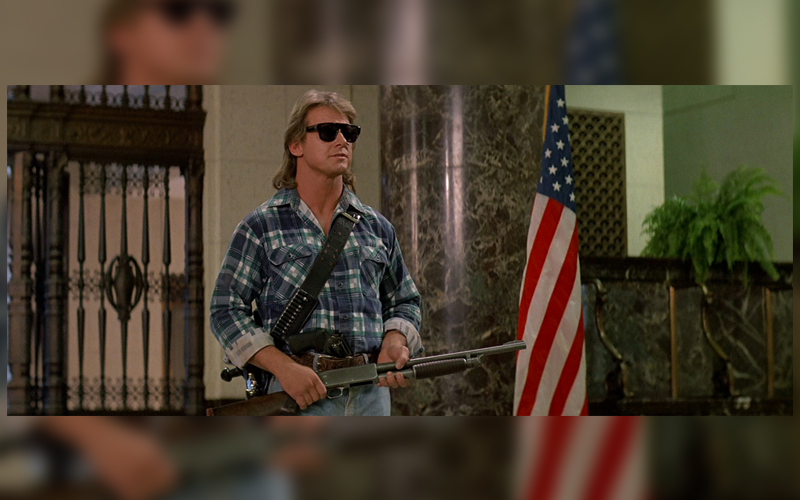 Though a sci-fi film on the surface, They Live shares common iconography with the western genre. Nada plays the harmonica like Charles Bronson’s enigmatic character from Once Upon a Time in the West (1968). The character also shares some qualities of pacifist lawman, Tom Destry Jr. (James Stewart), in Destry Rides Again (1939). They don’t seek out violence, but both can stand their ground should they be confronted by it. 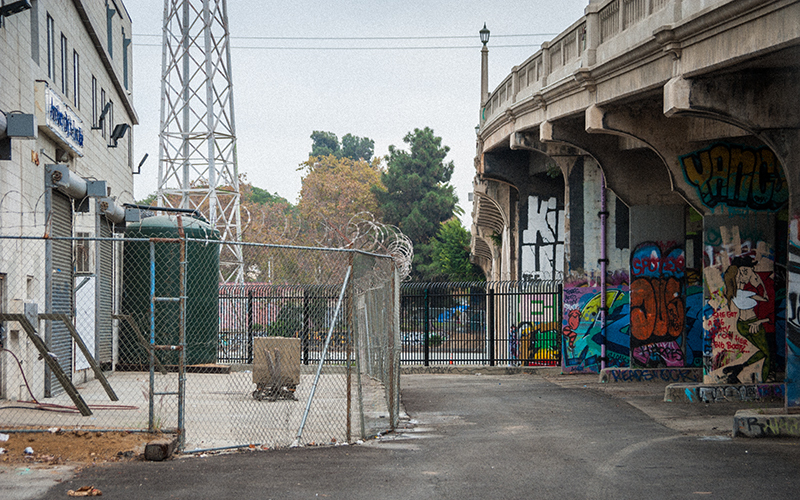 Nada walks towards downtown L.A.
North Spring St. along Los Angeles State Historic Park, originally a train yard. 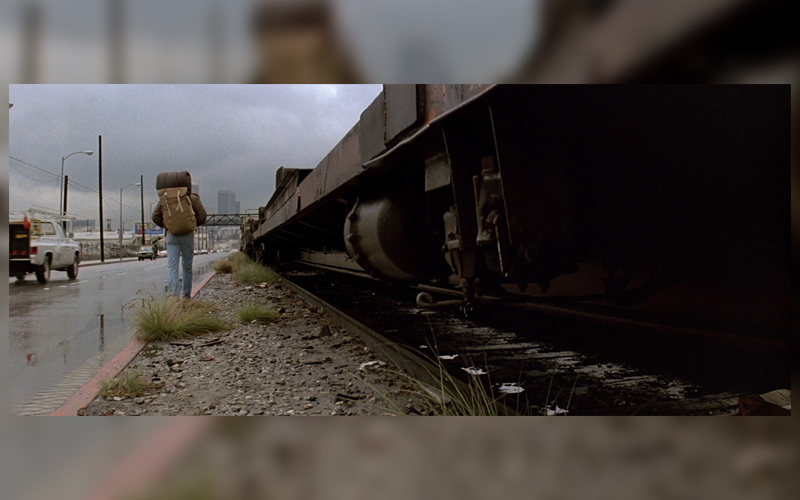 Carpenter and Alan Howarth’s score full of bluesy twang, harmonica, and percussion plays over the opening credits as Nada moseys into town from the train tracks underneath the Spring Street Bridge. He follows the tracks along Spring Street into the city. Much like the way a newcomer in a western film takes in the sites of the town—the saloon, the hotel, the general store—Nada continues into downtown, stopping for a moment to take in the immensity of glass edifices reflecting off one another as they rise toward the sky. 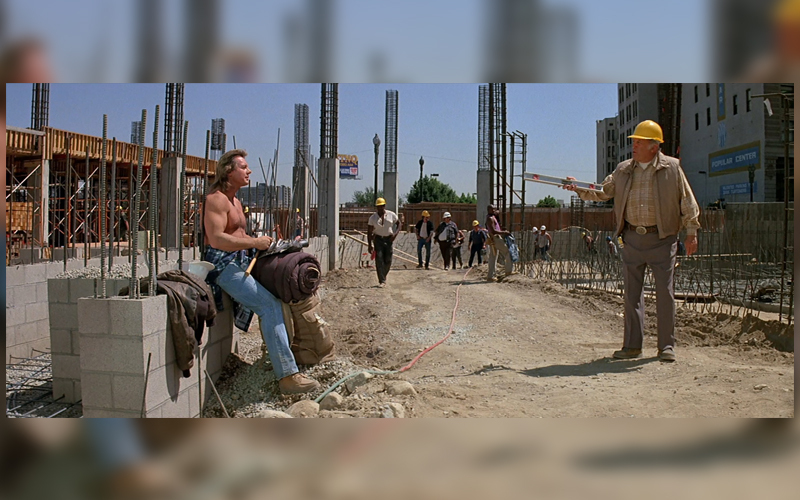 Immediately thereafter, Carpenter makes it clear what the streets of Los Angeles look like at the feet of the corporate headquarters Nada was just standing beneath. 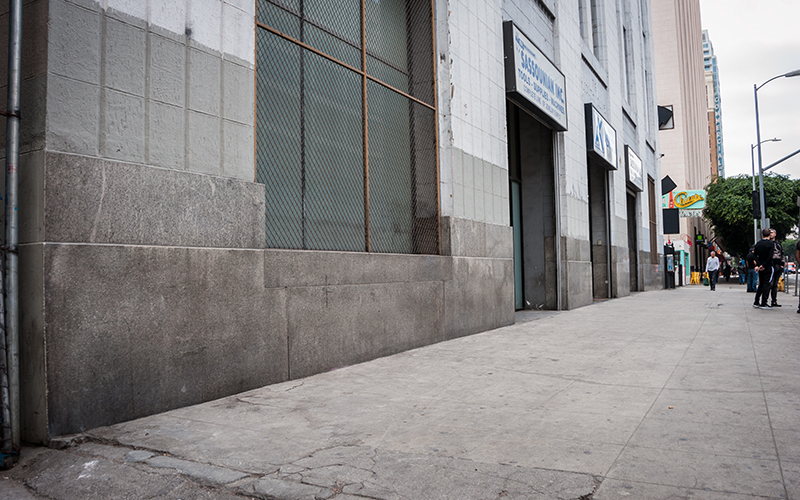 The filmmaker sends his main character through Skid Row where many of people seen on the streets were homeless individuals the filmmakers fed and paid to appear in the background. 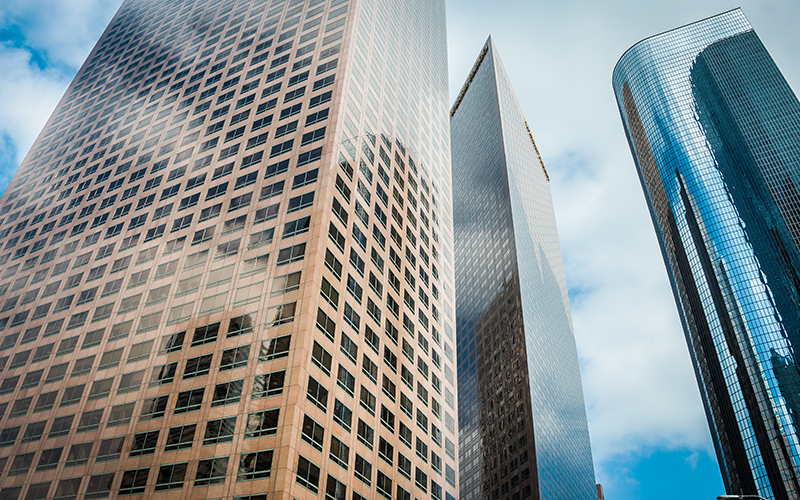 Nada’s POV of corporate L.A.
355 S. Grand Ave., left, 333 S. Grand Ave., and 300 S. Grand Ave.
Spring St. Bridge, 1731 N. Spring St.
Grand Ave. & 4th St.
Crocker St. & 5th St.
After his failed attempt to secure work at a job opportunities office, where, in retrospect, it’s quite possible the recruiter was a ghoul herself, Nada walks through a city park where a Street Preacher (Raymond St. Jacques) speaks to a handful of onlookers. Though blind, the preacher can truly see. He sermonizes about the worship of greed and a collective “they” who have enlisted the help of the rich and powerful to control the rest of mankind. As Nada walks into the park, visible street signs of 1st Street and Spring Street put the location on the south side of City Hall. The preacher speaks from the marble Frank Putnam Flint fountain, named after the Republican Senator from California (1905-1911) who led the fight for the construction of the Los Angeles Aqueduct, an achievement built on equal parts innovation and greed. 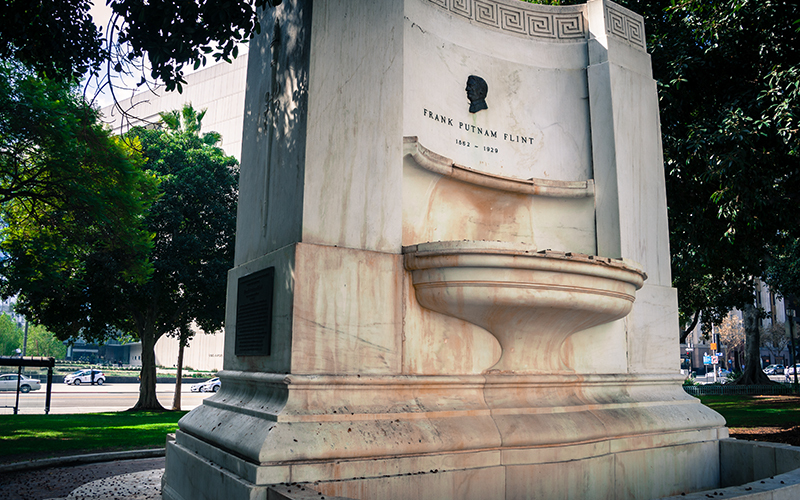 Ironically, the memorial doesn’t hold any water due to the fact that, as this Los Angeles Times article points out, an intoxicated homeless man drowned in the shallow fountain in the mid-1960s. 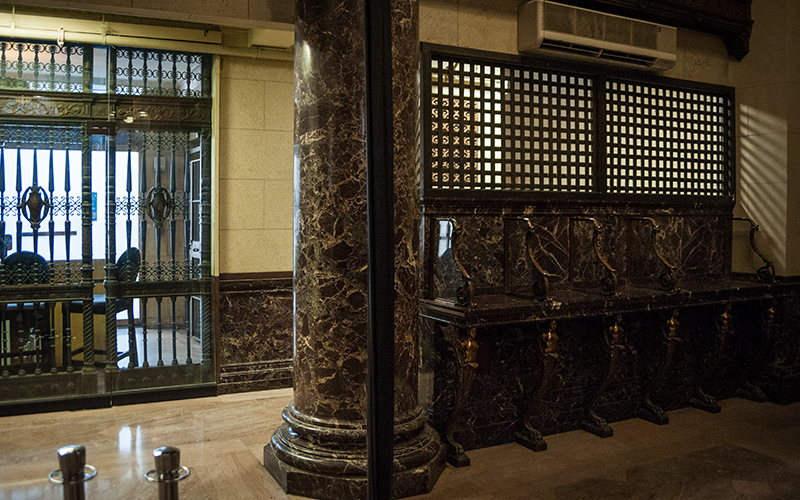 The former construction site was distinguishable once noticing, in certain shots, the 1903 Banco Popular building across the street in downtown’s Historic Core. The building seen under construction in the film is what would become the Broadway Spring Center, a parking structure with street level retail and restaurants. 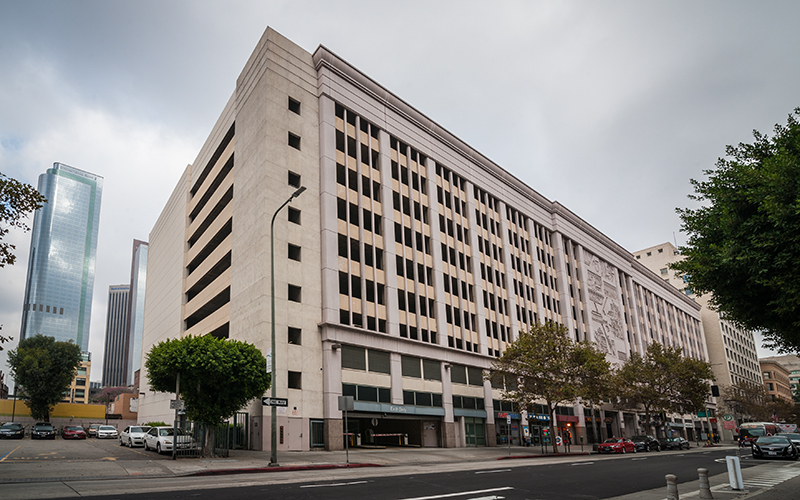 Behind the parking structure is a park named after Bridgett “Biddy” Mason, the well known Los Angeles landowner and philanthropist who was born into slavery and fought for her freedom. Mason purchased property at this address, where she lived, in 1866 for $250. 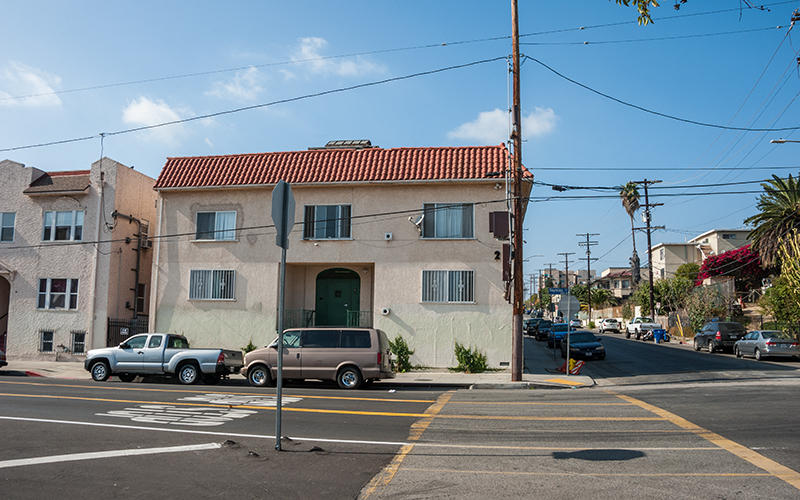 It was also the founding location of the First African Methodist Episcopal Church of Los Angeles. 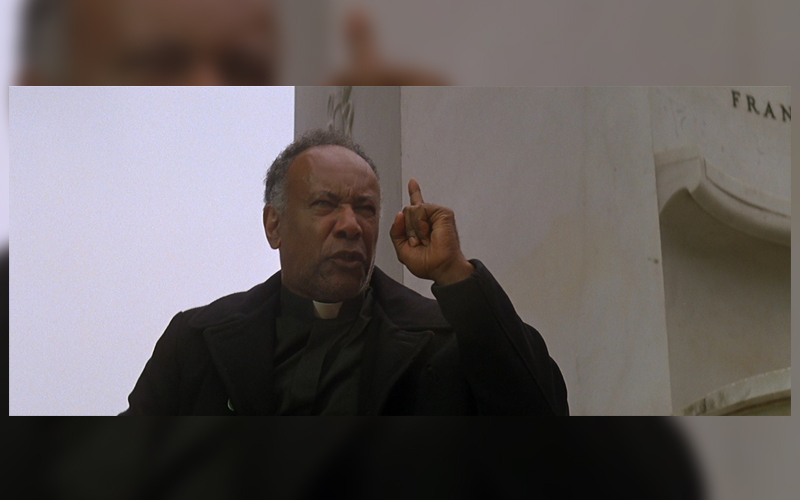 In January of 1985, advocate for the homeless and civil rights activist Ted Hayes organized a shantytown in Skid Row that became known as Justiceville. The self-reliant homeless community, which forced local government to take notice, was made up of over 70 people. While Justiceville had a phone and a few portable toilets, opponents wanted it shut down citing, among other things, vermin infestation and lack of running water. 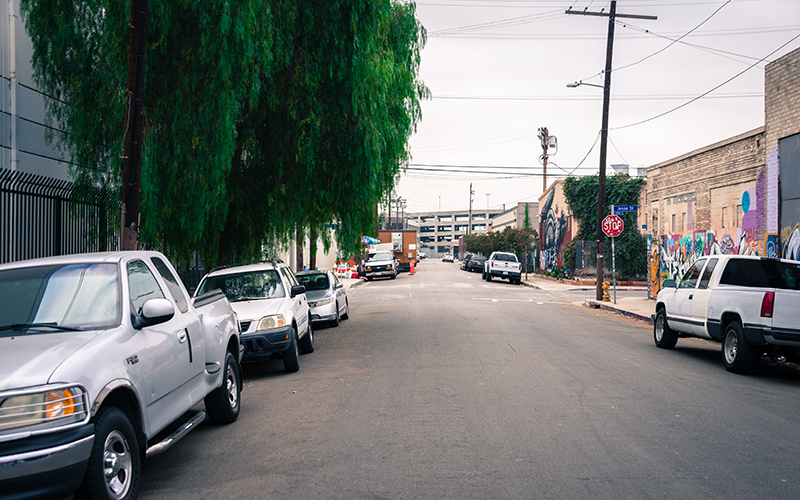 The parallels are uncanny between Justiceville and the community where Frank—a newly befriended construction worker and fellow drifter—is living. 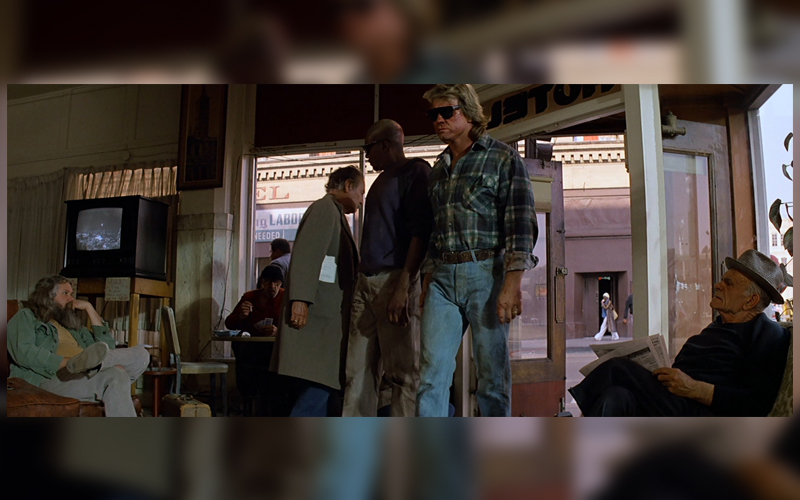 In fact, a track from the film’s score is called “The Siege of Justiceville.” Like Justiceville, the shantytown of They Live is made up of men, women, and children of multiple ethnicities. Furthermore, Hayes’s experiment was closed and bulldozed by the city on May 10, 1985. 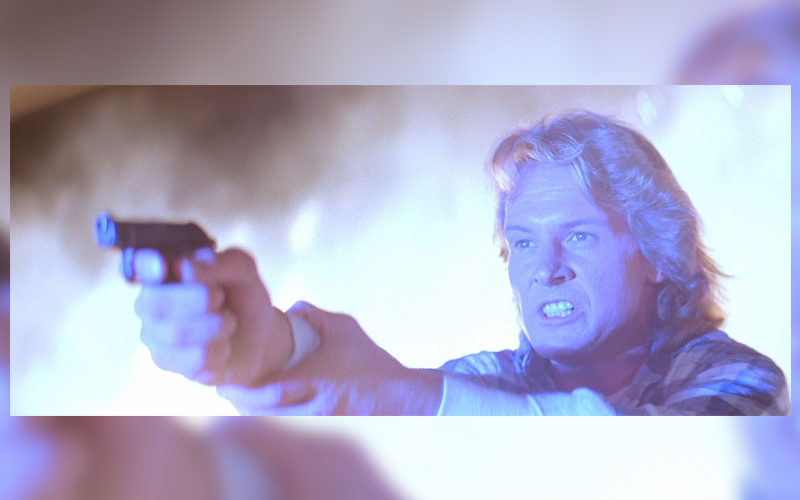 They Live’s shantytown is assaulted and destroyed in a war-like manner by the ghoul-controlled LAPD as a helicopter searchlight shines down from above and hellish red flares light up the ground. 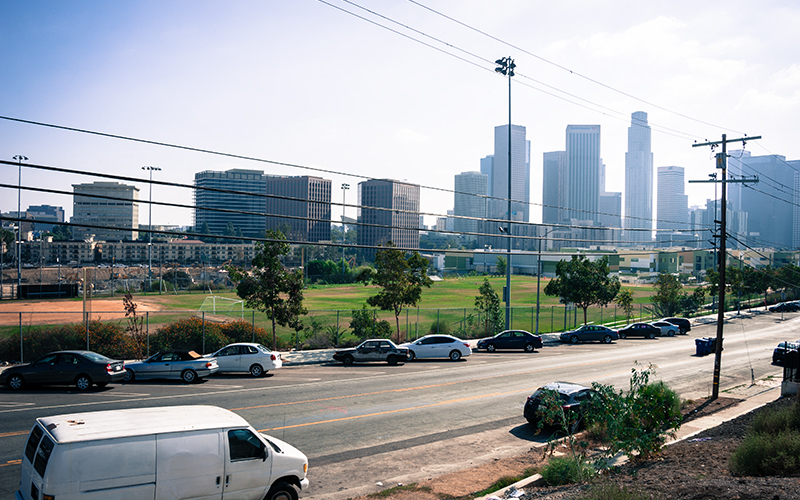 Today, the area that appeared as the homeless community in They Live is the soccer field of the Edward R. Roybal Learning Center, named after the first Latino L.A. City Councilman of the 20th century, later a congressman, who vigorously fought for equal education in his district, which was largely Latino. Development on the property for what was originally going to be the Belmont Learning Center began in the late ’90s, but seismic concerns and the fact that the school was being built over an oil field stalled the project for a number of years; some of the buildings that had been constructed were demolished. In 2005, a new architecture firm was awarded the contract for the school. A costly and advanced gas mitigation system was created, and the design, which included some of the existing structures, positioned the school away from fault lines and most of the old oil drilling areas. 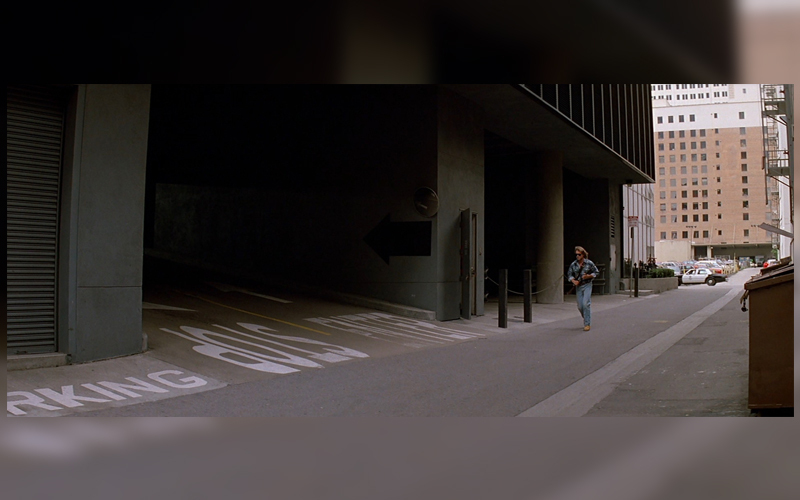 A major difference between the current soccer field and the location as it appeared in They Live is the erasure of a part of Court Street, which connected Boylston Street on the west to Beaudry Avenue on the east. 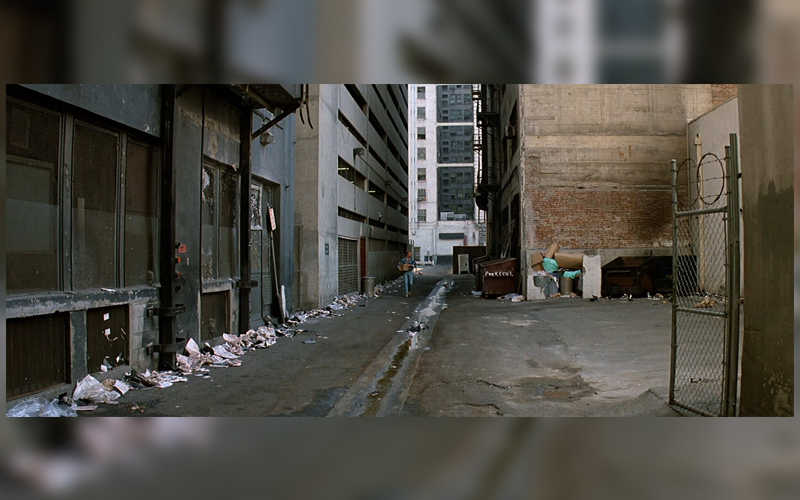 In the film you can clearly see this street as Frank welcomes Nada to the community. 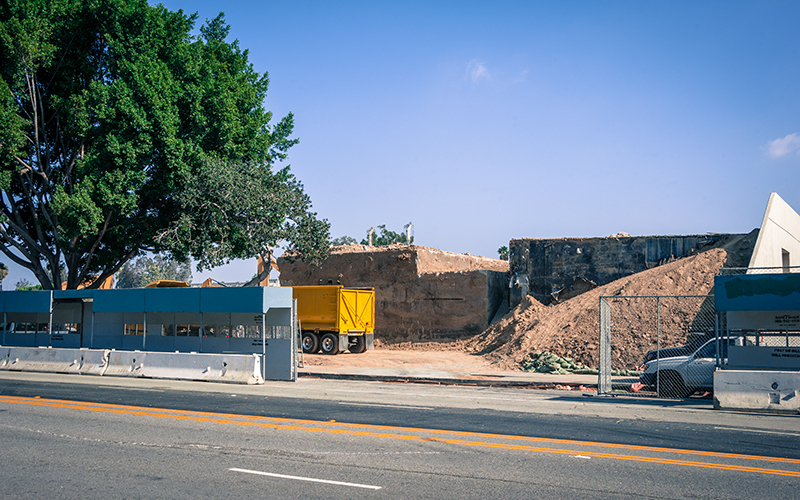 On the opposite side of the street was a vacant house used as a church that no longer stands. It’s in the church that Nada discovers a cache of hidden cardboard boxes, the contents of which he couldn’t yet fully understand. The name of the church that was used as a front for a resistance group fighting the ghouls: African Methodist Episcopal Free Church. One of the few remaining buildings around the location, as seen in the film. Following the destruction of shantytown, Nada reenters the church and takes one of the mysterious boxes that have been hidden in a secret wall compartment. Figuring the contents must be important, he waits to open the box until he’s sure no one is watching. Nada happens upon a trash-lined alley, and while crouching down next to a few trash cans he opens the box. Inside are dozens of plain black sunglasses. What could be so valuable that they needed to be hidden inside a wall? Nada hides the box inside a trashcan and keeps one pair of glasses for himself. 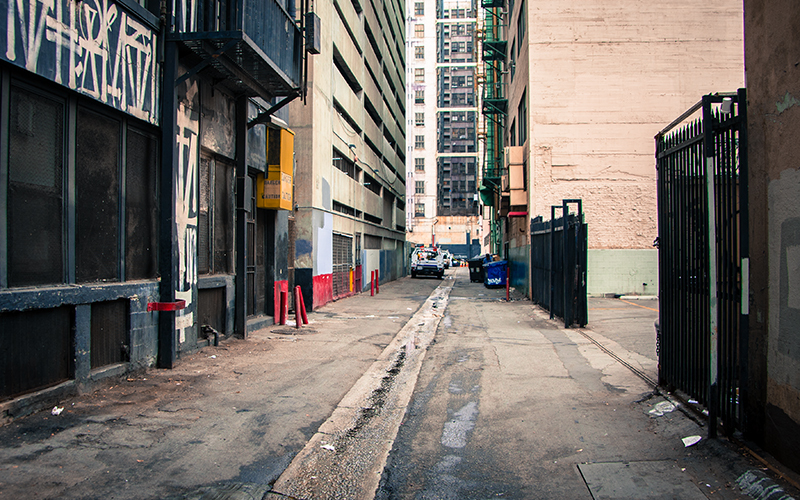 The alley is especially noteworthy not just because of its general use in They Live. It’s here that one of the greatest fight scenes in cinema history was filmed, which makes it hallowed ground to genre movie fans everywhere. After Nada discovers that the glasses allow him to see the oppressive world of the ghouls, he tries to convince Frank of the same. Nada asks him to put the glasses on, but Frank doesn’t want anything to do with Nada after hearing that he’s killed a couple of “cops.” What ensues is a five-minute-long fight scene that rivals the lengthy melee in John Ford’s The Quiet Man (1952), a street fight in Any Which Way You Can (1980) starring Clint Eastwood, and a corridor brawl in Oldboy (2003). 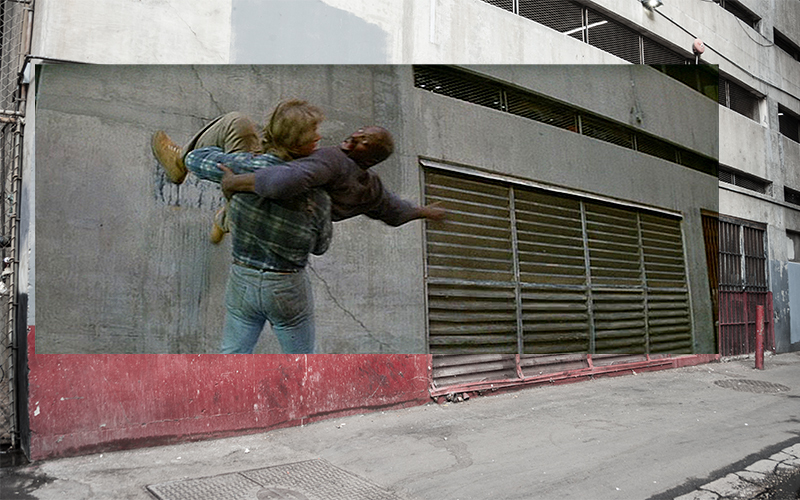 What makes They Live’s fight scene a standout is its raw simplicity—it’s two guys duking it out with no audience. Even when you think the fight is over, it’s not. The scene took a month-and-a-half to choreograph and rehearse, and it was shot in the alley over a period of three days. Mats painted to look like asphalt were laid on the ground to minimize impact to the actors. Mercy Ct., 419 7th St. The world turns to black-and-white as soon as Nada puts on the glasses. At the same time they filter out the color of the environment, the glasses also descramble the a signal the ghouls are sending out to keep humans “asleep”. 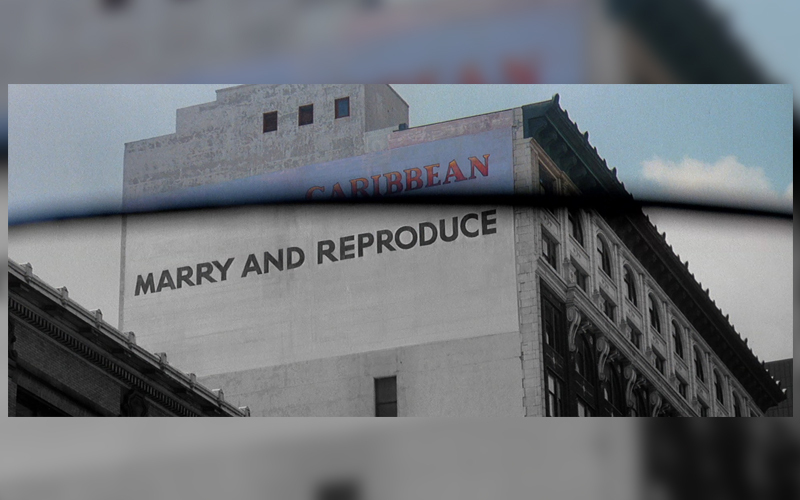 With the glasses on, a billboard advertising a technology company called Control Data turns into a stark message written in large, capital letters: OBEY. Another advertisement for a Caribbean vacation, featuring a bikini-clad woman lounging in the ocean as the waves rush over her, suddenly transforms in to MARRY AND REPRODUCE. The shots of the signage and the buildings were matte paintings done by celebrated matte artist and animator Jim Danforth. 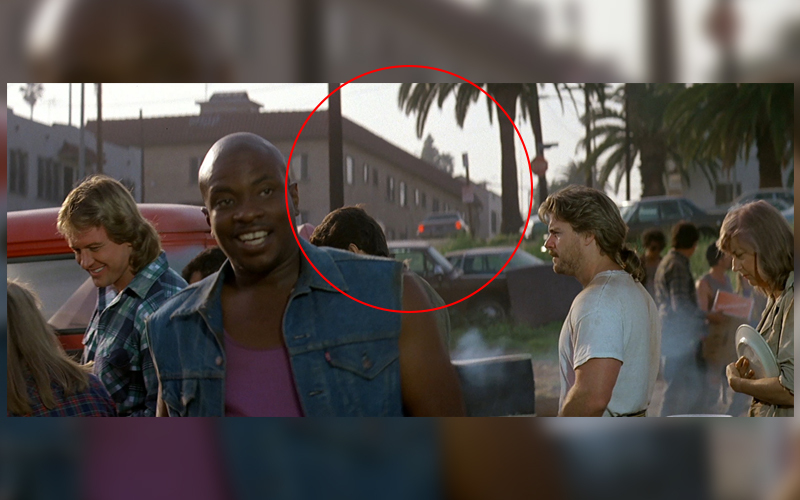 The buildings in the matte paintings, however, are actual locations near the intersection of Olive and 7th streets, right outside the Los Angeles Athletic Club, which is also featured in a number of shots. When Nada leaves the alleyway and put the glasses on for the first time, an edit occurs between two locations. 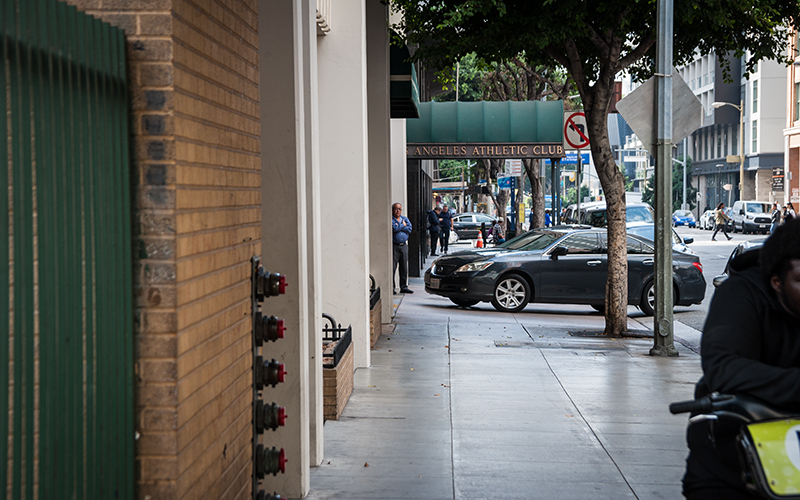 Rounding the corner of the alley and onto the sidewalk, Nada is now outside of famous art deco restaurant Cicada, which is recognizable from the colored tile work on the ground outside of the location. Continuing with the sequence, Nada notices a sign for Armisi’s Men’s Apparel, which, with the glasses, reads as NO INDEPENDENT THOUGHT. 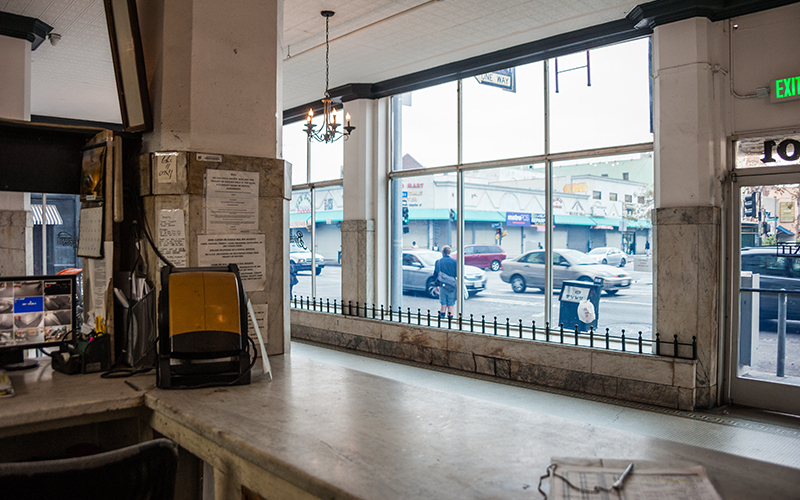 The location is next door to Cicada and features an antique wooden façade. Nada finally begins to grasp the reality of what he’s seeing through the monochromatic lenses when he approaches a magazine stand. There, everything from cigarette cartons, candy wrappers, and paperback books change appearance. Dollar bills appear as crumpled white pieces of paper reading THIS IS YOUR GOD. Glossy and vibrant magazine covers turn into white booklets with titles like NO IDEAS, REWARD INDIFFERENCE, and SURRENDER. Nada then gets his first look at a ghoul in the form of a well-dressed businessman. Down the block, Nada observes a ghoul businesswoman who fixes her hair in the reflection of a storefront window. As Nada looks on, he’s assaulted by two ghoul police officers that push into an alleyway. Nada kills both and takes their weapons. Los Angeles Athletic Club, 431 W. 7th St.
Obey Sign, 631 S. Olive St.
Marry & Reproduce Sign, 530 W. 7th St.
Cicada, 617 S. Olive St.
Armisi’s Men’s Apparel, 619 S. Olive St.
Magazine Stand, 640 S. Olive St.
Ghoul’s Reflection, 712 S. Olive St. 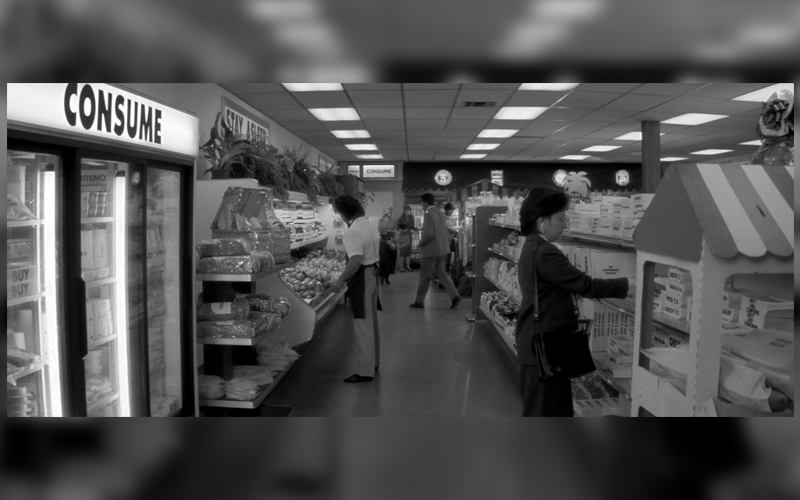 The actual market location could have been any one of hundreds of corner convenience stores. However, one wide shot of the store reveals the name “Hope” on an interior awning. Typing in “Hope’s market” into Google produced a store in Westlake. Upon visiting it was confirmed to be the grocery store location from They Live. 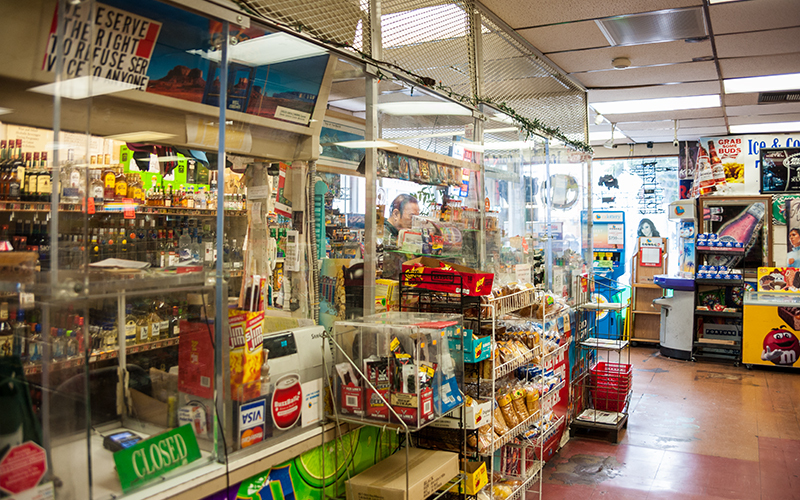 Hope’s Liquor Market, 1216 W. 7th St.
After taking the police officers’ guns from the aforementioned alley scene, Nada sheds his mild manners and turns into full-on gunslinger. A ghoul security guard opens fire and Nada responds with his shotgun, killing a number of ghouls as a result. 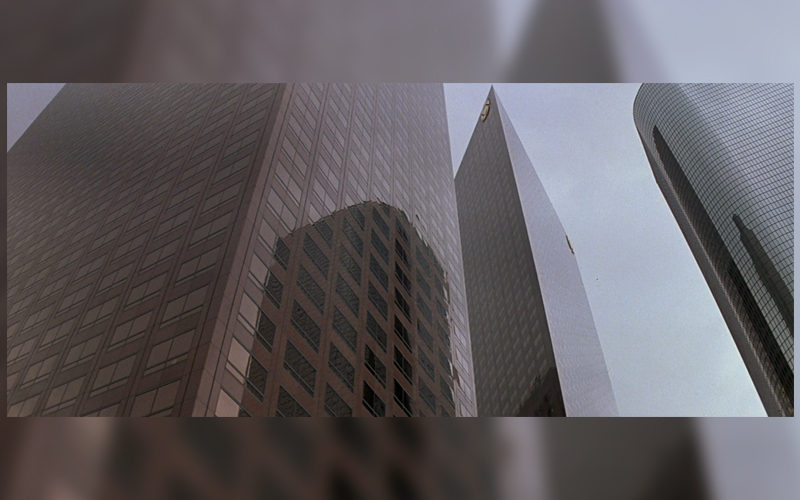 The bank location, the 1924 Beaux Arts building currently called the Majestic but also known as the Bank of America Building, has appeared in dozens of films including Ghost (1990), Se7en (1995), and The Dark Knight (2008). 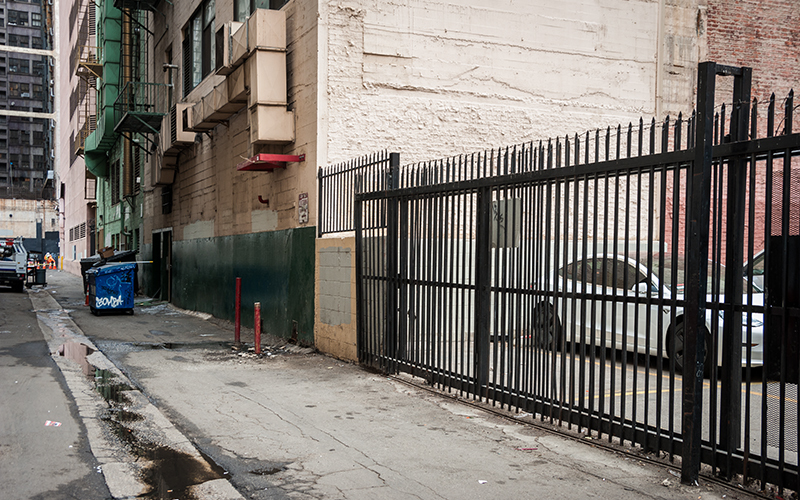 As police descend on the bank, Nada slips out the back door and into another alley about half a mile away from the Majestic. There, a flying surveillance droid observes Nada and sends his coordinates back to base. 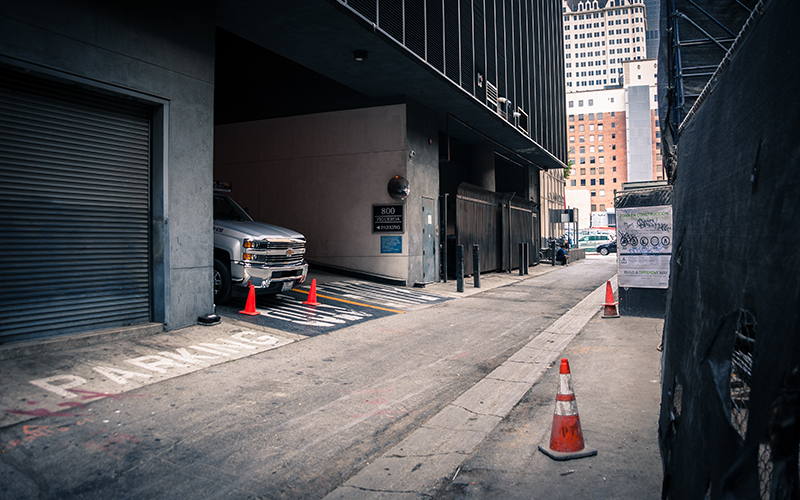 The Majestic, 650 S. Spring St.
Alley, behind 800 S. Figueroa St.
Having to get off the streets after their epic street fight, Frank and Nada retreat to a hotel. Frank has finally accepted the reality in which he’s living. With only a generic “Hotel” painted above the front door, almost as though it were a hotel in the Old West, finding the location was a challenge at first. 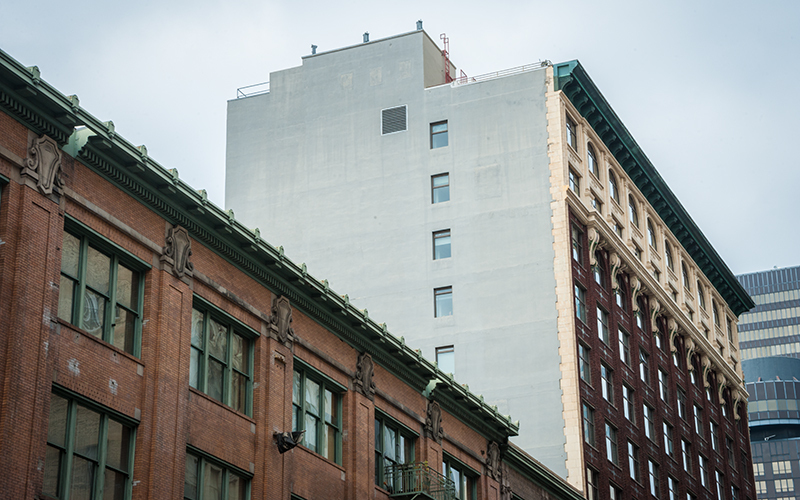 The only clues were what appeared out the front windows, which seemed to place the hotel on the edge of Skid Row considering the lack of tall buildings out to one side. 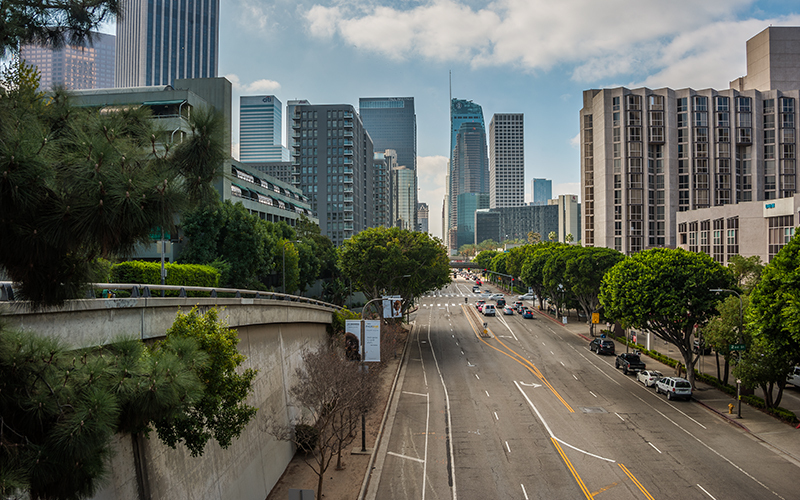 The production could have moved to a completely different area of Los Angeles, but a company move wouldn’t have made economic sense when just about the entire picture was centered around downtown. Out another set of windows appears hotel and, because of some neon Budweiser signs, that hotel appeared to have a street-level bar. 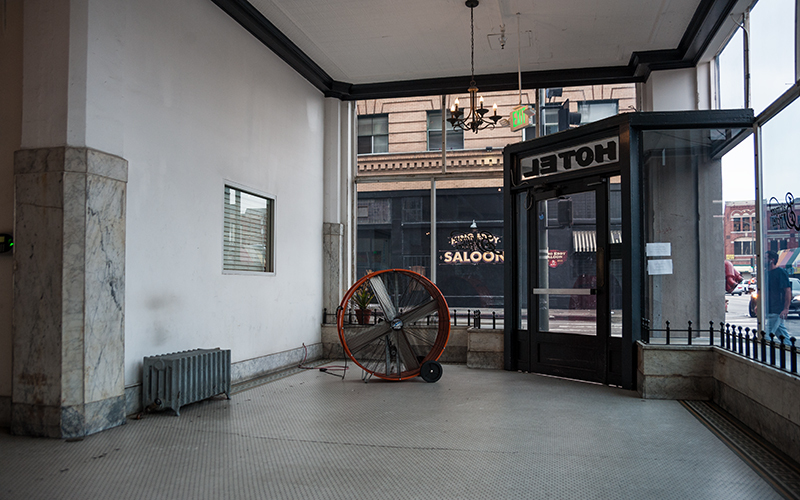 This pointed us to the King Edward Hotel and the King Eddy Saloon, which are directly across the street from the 1910 Baltimore Hotel, the location of Nada and Frank’s hotel. The actual hotel room itself was built as a set. 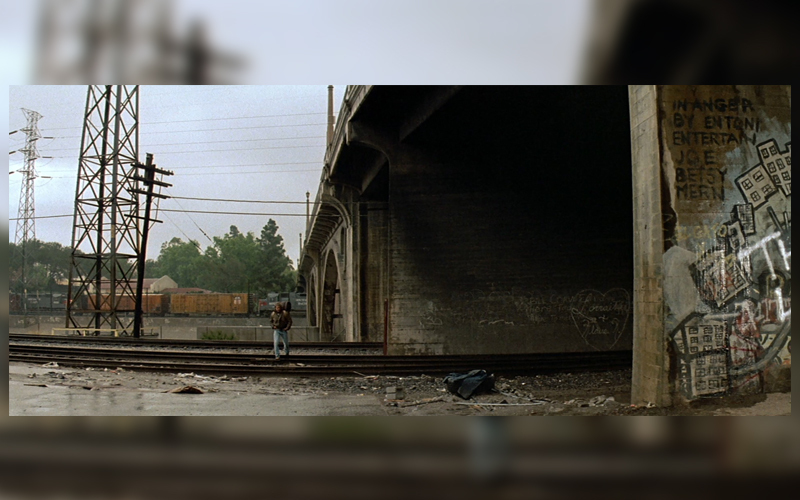 501 S. Los Angeles St.
Gilbert (Peter Jason), one of the resistance leaders, tracks down Nada and Frank at the hotel and tells them about a meeting of others who are “awake”. That evening, the two walk down a dark avenue lit only by a couple of overhead street lamps. They enter the building and walk into a warehouse lacking the energy and crowd that Gilbert was hoping for. Nada and Frank are given brand new pairs of contact lenses designed for seeing the ghouls. As the meeting progresses, the location is breached by savage police force that exterminates almost every living soul in the room. Nada and Frank fight their way into an alley, miraculously escaping the onslaught by using an alien wristwatch to create a temporary portal into an underground lair. Today, the brick warehouse location is no longer standing. Across the street, buildings recognizable from the attack scene are still visible. The ghouls’ massive center of operations in Los Angeles is connected by a series of underground tunnels and is comprised of upscale meetings room, a broadcast center from where the “sleep” signal emanates, and a beaming system back to the aliens’ home planet. The setting is combination of multiple locations. 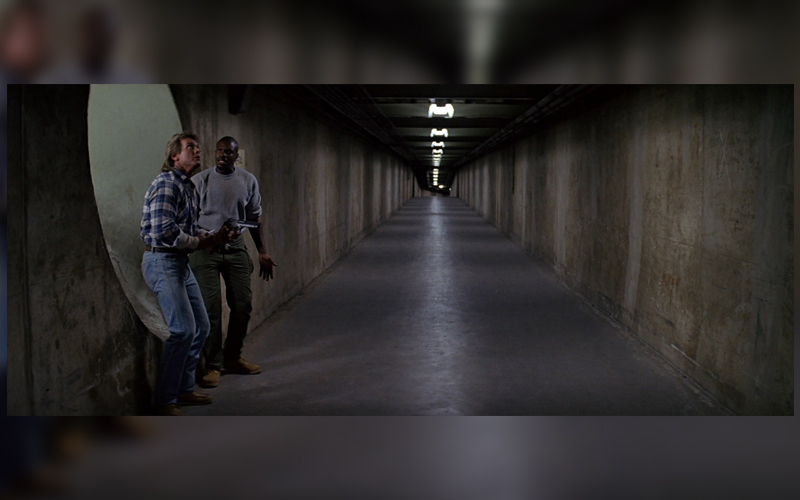 The infamous pedestrian tunnels underneath the civic center provide the backdrop for the corridors connecting the entire alien operation. Though many urban explorers have ventured into the miles of secret tunnels, they are technically off limits to the public. After walking a short distance through the tunnels, noticing indistinguishable alien writing on the walls, Nada and Frank find themselves in the middle of an ornate ballroom. The ghouls are thanking the “human power elite” who have sided with the aliens in exchange for infinite power and money. 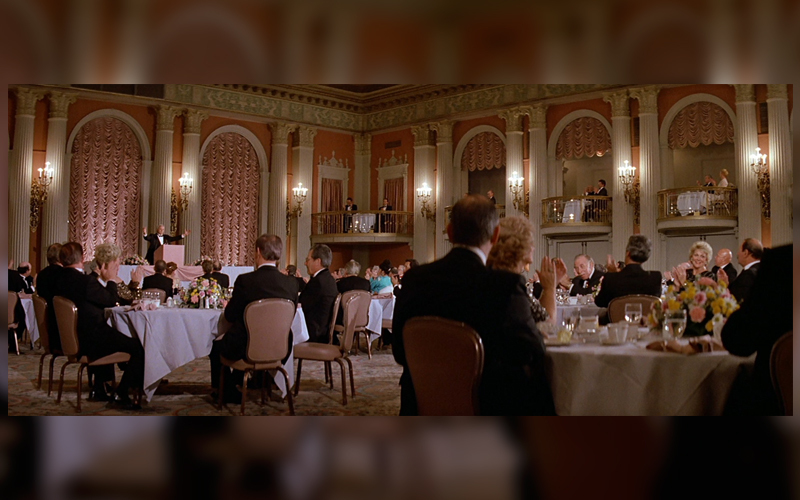 This is the Crystal Ballroom of the Millennium Biltmore Hotel, which is no stranger to filming. The hotel has been seen in movies such as Ghostbusters (1984), Beverly Hills Cop (1984), and Pretty in Pink (1986) to name just a few. Trying to find the signal’s broadcast point, Nada and Frank storm the rest of the building, moving office by office and hallway by hallway. 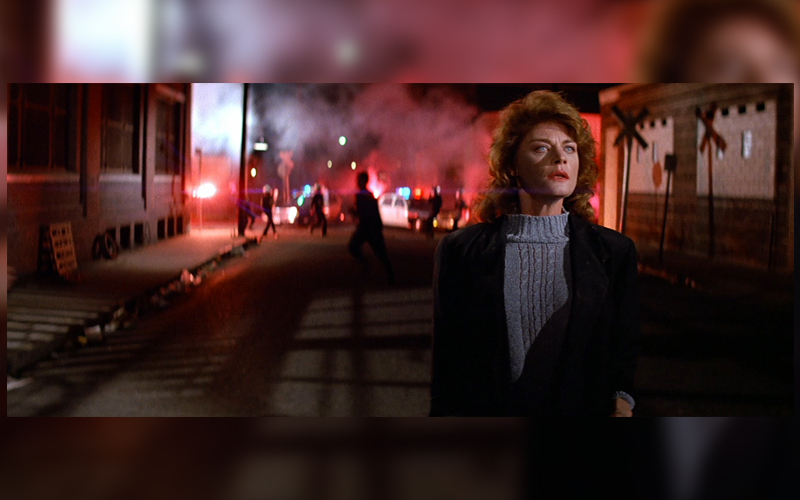 After Holly (Meg Foster), the film’s femme fatale, kills Frank, Nada makes his way to the roof where he finds multiple satellite dishes and the signal’s source. Determining the location was almost as difficult as Nada finding the roof. The nighttime exterior doesn’t provide a lot of visual information. However, at the top of one building in the distance are illuminated letters reading ARCO, which led us to City National Plaza at 515 S. Flower Street, originally called Arco Plaza when it opened in the early ’70s. Upon lining up other buildings in relation to Arco Plaza we found an office building directly across the street from the shantytown location. A Google satellite image showed the stairs that Nada ascends to reach the roof as well as a matching barrier wall. 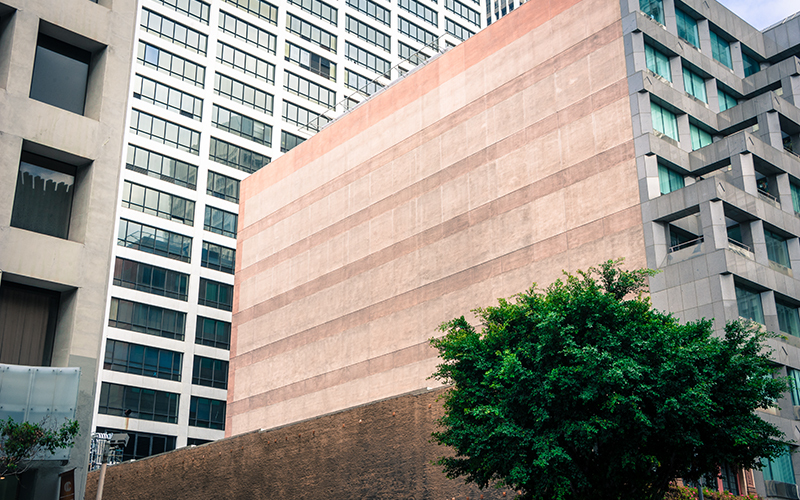 It is still visible on Google street view, but demolition began last summer on the cubiform office building that was built in 1977 and was strangely void of windows on its upper floors. 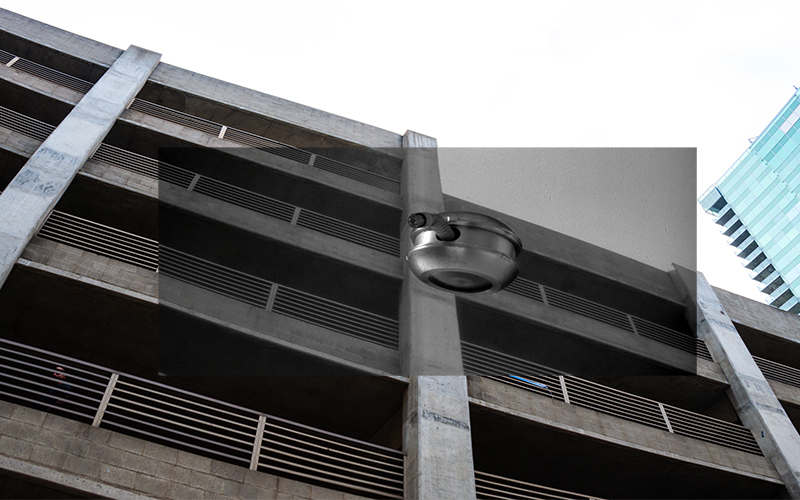 An adjoining parking structure, also used for a scene in which Nada kidnaps Holly, was completely demolished earlier this year. 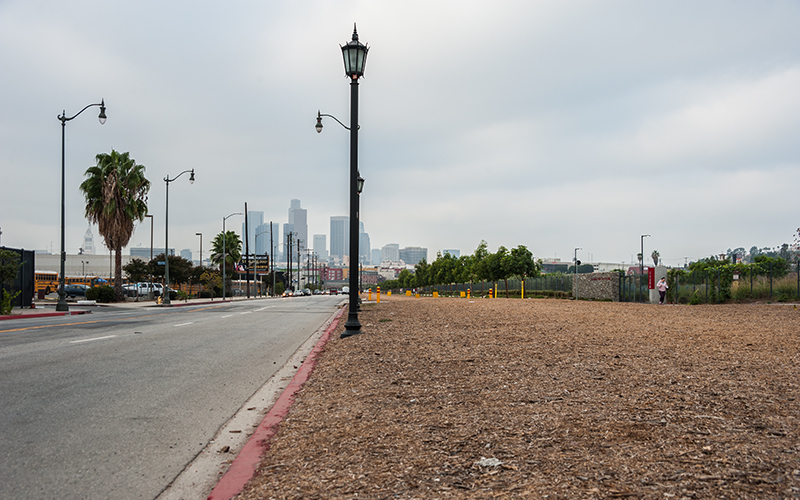 In its place will be yet another freeway-adjacent mega apartment complex along the 110. 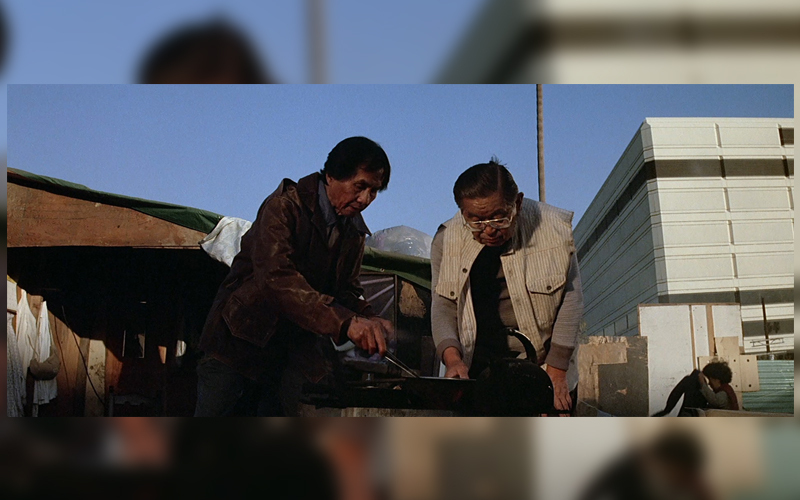 A couple cooks their food in the shantytown; the roof location of Cable 54 is seen in the background. Millennium Biltmore Hotel, 506 S. Grand Ave.
Cable 54, 1000 W. Temple St.